Are you concerned about the direction our society seems to be taking? Do you feel concern not only for yourself, but also for younger generations such as your children, grandchildren, and great grandchildren? Is it your desire to leave this earth a better place because of you and your contributions? Life is full of challenges. Tests and trials can allow a stronger you to emerge. In order to survive and grow in these difficult times, do you know how to weather the storm? Do you have a strategy in place to overcome the challenges that you face? Whether a person in transition, a parent, business person or all of these, what can be learned from the bushido code of the samurai? Who were the samurai and how could a people dedicated to war and violence have such an impact on a culture known for its politeness, manners and aesthetic beauty? The samurai warrior of ancient Japan lived by a moral and ethical code known as bushido; ‘the way of the warrior.’ This code of chivalry sculpted a culture and influenced all aspects of Japanese society. After the earthquake and tsunami of March 11, 2011, the world witnessed the characteristics of bushido: courage, Integrity, honesty, honor, benevolence, respect and ganbaru. 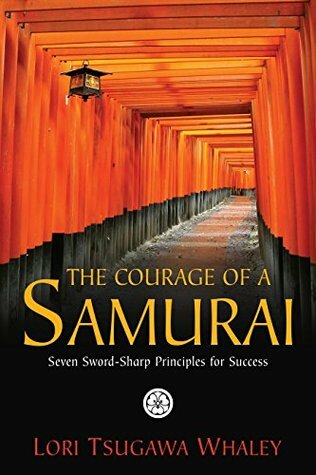 The Courage of a Samurai presents these principles as a guide for navigating the challenges we all face personally and professionally, with examples of individuals who exemplify their meaning in today’s world. It was laid out like a devotional, with a page or two about one of the seven tenets of bushido and then a couple of examples of people who embodied these qualities. I don’t think it’s any coincidence that the layout reminded me of a devotional as there were several references to the Bible throughout. Most of the examples were about Japanese or Japanese-American people during WW2, which, though inspiring and meaningful, weren’t really examples that could be applied today as suggested in the book’s description. This book was a testament to the author’s pride in her Japanese heritage and who can blame her? I’ve always been fascinated by Japanese culture, especially the emphasis on respect, altruism and self-discipline. These qualities are admirable and make the world a better place. I remember seeing something on the news a few years ago that moved me to tears – retired seniors in Japan were working in Fukushima after the disaster to make the area safe again, knowing that the radiation would cause them harm but understanding that they had a shorter life span and their work would make the place safe for future generations. This book was straddling the line, trying to be one of two things but couldn’t decide which to go with – a book about the treatment of Japanese Americans during WW2 and a book about applying Samurai qualities today. Both of these are excellent areas to cover, but by trying to do both, the message didn’t pack the punch it could have done. This is a book I’d recommend more for its historical content, especially the messages about the US concentration camps that were kept hidden for so long. The author’s pride in her heritage is heartwarming and something that anyone reading this book will be able to appreciate.